Late Sunday night, Jan. 20, 2019, into Monday, Jan. 21, millions of people in North America will witness a total lunar eclipse. The entire eclipse will last five hours, but totality will last for 62 minutes. Stargazers in California will see the full moon become tinted with the red-orange color of sunset starting at 20:41 PST on Sunday, Jan. 20. The Jan. 21 total lunar eclipse will be the last one until May 2021, and the last one visible from the United States until 2022. Click here for more information on when to see the total lunar eclipse in every U.S. State. 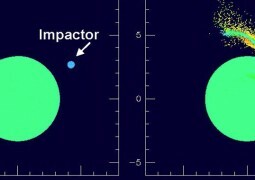 SSERVI researchers used state-of-the-art models to show that a Vesta-to-Ceres-sized impactor could produce Mars’ small moons.